What makes Paris one of the most beautiful cities in the world? Is it the cobblestoned streets of Montmartre, the bridges traversing the Seine River or the city's wide boulevards lined with harmonious buildings? If you're as intrigued by this question as I have been during the past three years, join one of Context Travel's "City Invented, Haussmann and the Making of Modern Paris" walks. For intellectually curious travelers wanting to delve deeper into a subject, the appeal of Context Travel's tours, or "walking seminars", is that they're all led by Ph.D or MA level art historians, architects, scholars or specialists. Last week, I rendezvoused with docent Caroline Rossiter, an art historian whose thesis at the Sorbonne was on popular imagery and caricature in Revolutionary and Napoleonic Paris, and a friendly couple from Michigan. Our first stop on the three hour walk was the main courtyard of the Louvre. I.M. Pei's "some-love it, some-hate it" glass pyramid served as the perfect backdrop for Caroline's engaging discourse on urban planning and Paris' penchant for merging the new with the old. Photos and maps displayed on Caroline's iPad enabled us to envision the Louvre's successive architectural metamorphoses. Galerie Vivienne, built in 1823, has been a registered historic monument since 1974. From the Louvre, we meandered through the Palais Royal, the city's first shopping and entertainment complex, before making our way to the Galerie Vivienne and Passage des Panoramas covered shopping arcades. Built between 1790 and 1850, these architectural gems are visual reminders of why Baron Haussmann continues to be such a controversial figure. 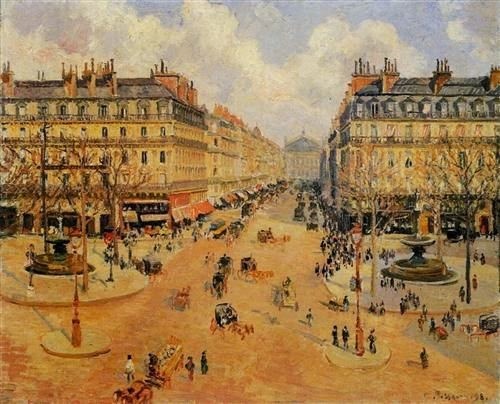 The "demolition artist", as Haussmann proudly referred to himself, destroyed most of the city's other arcades in the name of progress. For those who haven't yet visited the Palais Garnier Opera House, this gilded masterpiece of Second Empire urbanism is undoubtedly the highlight of the walk. In between answering our numerous questions and pointing out architectural details, such as the thirty different types of marble used in the foyer with the grand staircase, Caroline recounted anecdotes about the building's construction and life during Napoleon III's regime. Currently in 25 cities around the world, Context Travel's walking seminars are designed to ignite people's passions for history and culture. Baguette to Bistro: Culinary Traditions of Paris, Immigration and the Changing Face of Paris and Le Jazz Hot, An American Art Form in Paris are a few of the options available in Paris. All of the walks are limited to a maximum of six people. Context Travel has graciously offered a discount of 5% to Out and About in Paris' readers. To book a tour at the reduced rate, simply click here for an automatic reduction or mention Out and About in the trip notes. Please note that you'll only see the automatic reduction when you're ready to check out. How cool! One of the books that I read before I went had side-by-side pictures of streets before and after his "demo" work. There are some spots where the only thing left is a single solitary lamp post! How nice to go with someone with a deep knowledge and passion for the subject. Thanks for sharing! Wonderful article! We are so pleased that you enjoyed the seminar!